Fruitless Pursuits: Walt Disney Presents: STAR WARS!!! 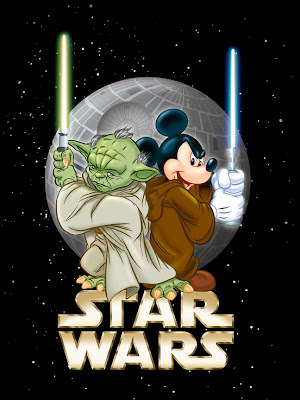 Disney has just agreed to PURCHASE LUCASFILM from George Lucas for 4.08 BILLION dollars!! This means that they'll own the rights to Star Wars, Indiana Jones, etc. as well as ILM, Skywaker Sound and LucasArts. Probably they get to play with R2-D2 too. Who knows? Hot Snow falls up here in backwards land!! the biggest news? STAR WARS EPISODE VII in 2015!!! Read the official press release here! Thoughts? Good thing? Bad thing? I don't know WHAT to think! I know what to think... I CANNOT WAIT. You guys are missing the big picture - Disney now owns Marvel AND Lucasfilms - Howard the Duck is a lock for the next Avengers movie!